The X Files Reboot, reviewed. 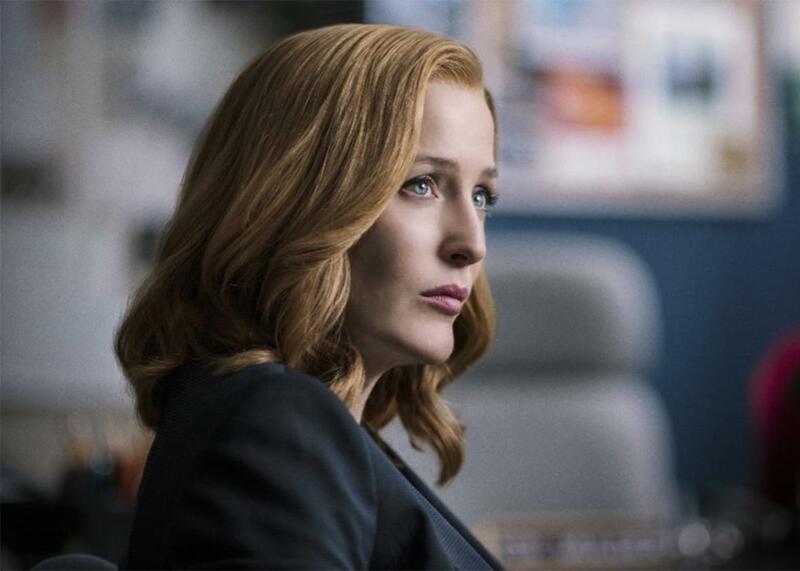 Gillian Anderson, skeptical as ever, as Dana Scully in The X-Files mini-series. Image courtesy of Fox Broadcasting Co.
Well, I thought, upon completing the first episode of the rebooted The X-Files, it was inevitable. The desperate gambit to revive any show that can be revived, from Twin Peaks to Full House, was destined to ruin something—if not everything—and The X-Files just happens to be the first beloved TV show to come back to life as a flaming dud. With the eerie shimmy of the credit sequence still sounding in my ears, I wondered if this was not a merciless kind of justice. Reboots are a shameless and cynical attempt to grab ratings and attention. If they succeed, we get more of a thing we already had enough of, which we get excited about because it is the human condition to not grok the concept of “enough.” If they fail, they undermine the integrity of the original and our fond memories of it. (Assuming those fond memories had survived The X-Files’ long, incoherent final years in the first place.) Look, the truth is out there and it is hot garbage. It seemed to me there was something so definitive about this that even perpetual searcher Fox Mulder—jolted out of the deep cryosleep of fictional beings because that other Fox, the network, needed some buzz—could appreciate it. Then, feeling diligent, I watched the other two available episodes. The third one was pretty cute and funny. What had I been saying? Yay! The X-Files is back!! But about that painful first episode. The X-Files picks up in the present day, some 13 years after the FBI shut down the X-Files, the department investigating paranormal activity run by true believer Fox Mulder (David Duchovny) and part-time skeptic Dr. Dana Scully (Gillian Anderson). In voiceover, Mulder swiftly asserts that he is still a broken record stuck on the song “UFO Crackpot.” He’s still asking questions like “Are [UFO sightings] really a hoax?” and “Are we truly alone?” It seems that nothing has changed—except everything has. It all has all gotten unbelievably janky. Over the course of the episode—called “My Struggle,” because, apparently, Karl Ove Knausgaard has fully reclaimed the phrase from Hitler—Mulder and Scully, who are no longer a couple, but were a couple, but will only allude to it in clankingly elliptical ways, get hip to the real conspiracy, which is not the same conspiracy they spent nine seasons and two movies obsessing over. Tad O’Malley (Joel McHale), a far-right pundit and UFO-ologist, enlightens them about the real conspiracy, a plot that manages to tie in climate change, the NSA, the Patriot Act, the prison-industrial complex, agribusiness and consumerism with the cover-up at Roswell. It’s not aliens we have to fear, but a multinational group of men who have been secretly developing alien technologies and conducting nefarious alien experiments with imminent plans to take over America, and then the world. The X-Files, like all great conspiracies, drew much of its power from the way it fractured and reset real events, using bits and pieces of accepted history to bulwark a dark, alternate reality. Like all great conspiracies, its power was not so much in being perfectly explanatory, but in being perfectly paranoid: It had a great, contagious style. The first episode of the new season updates and recasts The X-Files conspiracy as one of class warfare—What if the 0.001 percent had alien technology?—which has a certain timely ideological swag to it. But the episode has no panache, no grace, no mood. The dialogue in the first episode is stiff and ponderous. “Aliens couldn’t find this place,” Scully says to Tad, “how did you?” They are in Virginia at the time. Mulder and Scully speak around each other in muddy sound bites. “This will finally be their undoing,” Mulder tells Scully. “It will be your undoing, Mulder,” she replies. “This is my life, this is everything, this is everything I’ve ever believed in,” Mulder cries. “You want to believe, you so badly want to believe,” Scully says. “I do believe,” Mulder says. The “this” they are discussing has never been clearly stated. Even Mulder and Scully’s much vaunted chemistry, all barely suppressed fizz, has gone inert. “The X-Files is closed. We’ve moved on, for better or worse,” Scully tells Tad. “Yes, we have,” Mulder says, before taking a meaningful pause and looking at Scully with shameless puppy dog eyes while repeating, “for better or worse.” The coyness around their relationship, once so provocative and thrilling, now feels like a contrived put-on. Mulder and Scully are middle-aged soul mates who lived together for years: It is not plausible that they wouldn’t speak to each other more openly. Their entendre-filled conversations seem to be strictly dummied up for the audience. I’d rather see them kiss. But as most devoted X-philes would tell you, the mythology episodes of the series were never the best ones anyway. After the catastrophe of the first episode come two self-contained installments, each improving on the one that came before. In the first, Mulder and Scully investigate a creepy tech-genius, known as “the founder,” working with children who have rare genetic conditions and/or exposure to alien DNA. It’s less stilted than the first episode, but still weighed down by extraterrestrial baggage. The third episode, not coincidentally the one in which the show rediscovers its dry sense of humor, finally gets on track. In this episode, Mulder and Scully go investigate a possible were-lizard. Mulder, still adjusting to a life lived inside a conspiracy of men and not a conspiracy of ETs, takes a turn playing the skeptic. But skepticism doesn’t suit Mulder, and the show trots out a cheeky Twilight Zone–like twist to the usual werewolf tale (as well as the revelation that Mulder sleeps in a satin thong). Halfway through, an amped-up Mulder breathlessly regales Scully with all the reasons the were-lizard might be real. “Yeah,” Scully nods, “This is how I like my Mulder … bat crap crazy.” Co-sign.